Earthquake Geotechnical Case Histories for Performance-Based Design is a collection of 26 case histories, each study containing well-instrumented geotechnical and earthquake data. 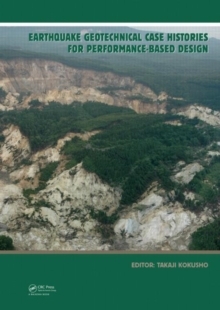 The book is intended to serve as a reference work, since it contains a common scale to develop and implement design methodologies and numerical analyses, so that their reliability can be evaluated. Each case history consists of site characterization, earthquake motions and descriptions of failure as quantitative as possible. Wherever available, digital data on earthquake records and other information associated with individual cases are supplied in the attached CD-ROM as text files EARTHQUAKE GEOTECHNICAL CASE HISTORIES FOR PERFORMANCE-BASED DESIGN will be invaluable to researchers in earthquake geotechnical engineering, practicing geotechnical engineers, as well as engineers and researchers interested in numerical analysis.